Here is my third entry for the Four a Month Flickr group. 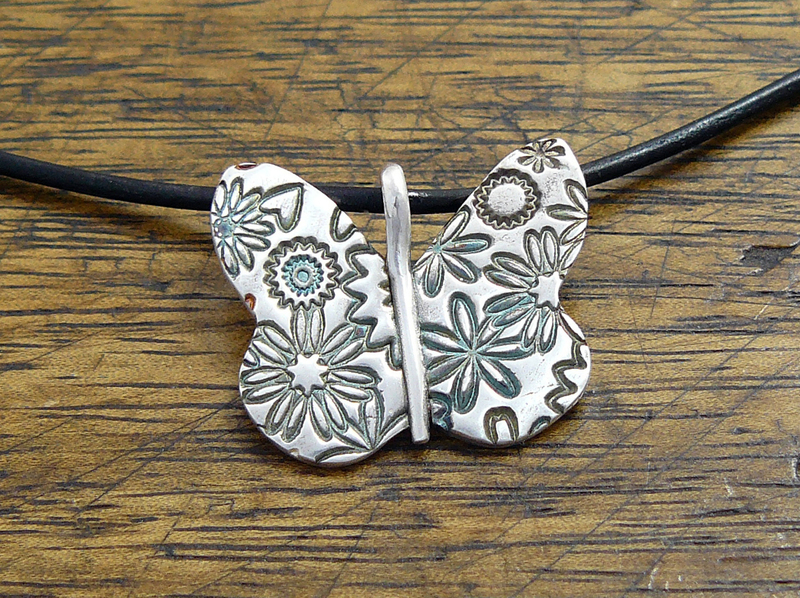 This butterfly is less naturalistic, with a floral pattern. 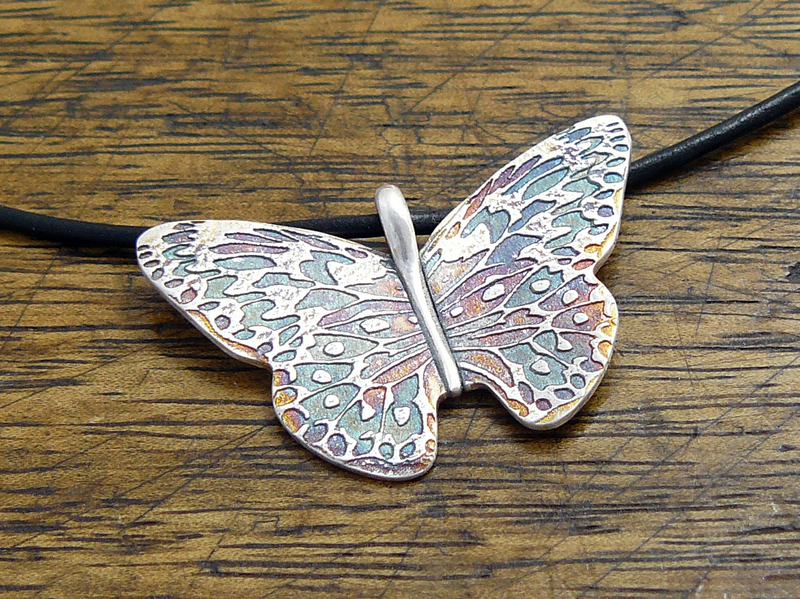 The last butterfly piece is a pair or earrings. The photo for those will be posted tomorrow. Then I will begin posting photos of the 4 seasons pieces. It does feel strange today to post photos of summertime creatures with snow on the ground here. We have had a very mild winter and I am thankful for that. Happy Valentine’s day everyone! Here is my second entry for the Flickr Four a Month group. 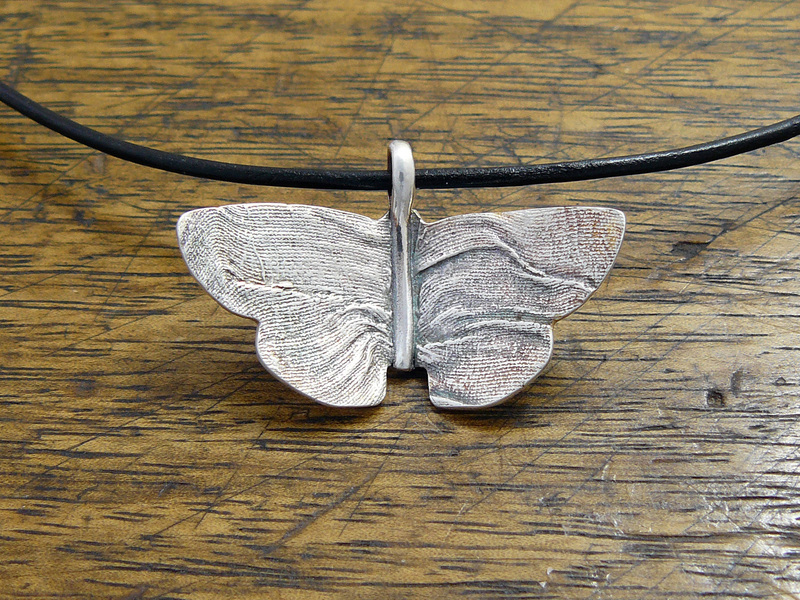 The photo above shows my fine silver butterfly. This butterfly, which could be a moth if you like, was inspired by the way butterfly wings reflect the light when you look at them at just the right angle. I used a crushed silk textured wallpaper sample to create the wings. I love the way the wings stand out from the body on this one. It feels as if the creature is fanning his wings and is about to take off. 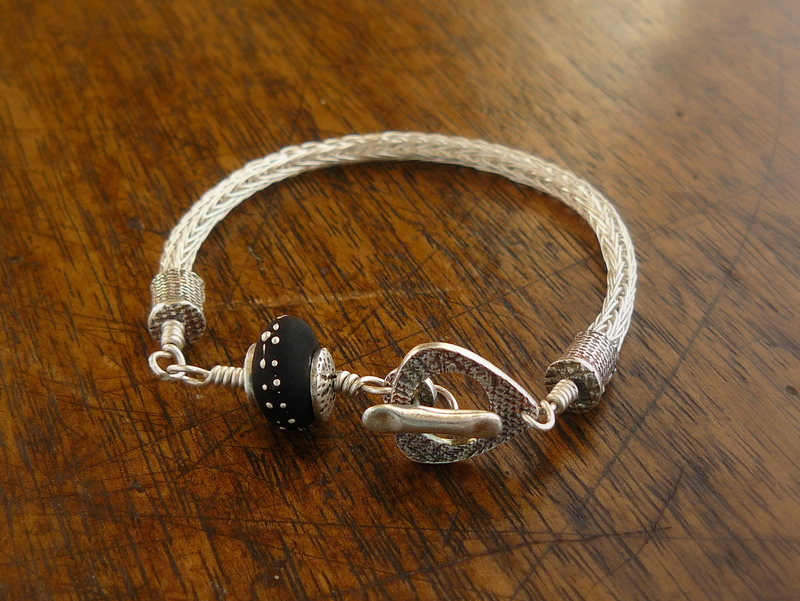 Near the end of the year in 2011 sterling silver metal clay was introduced. 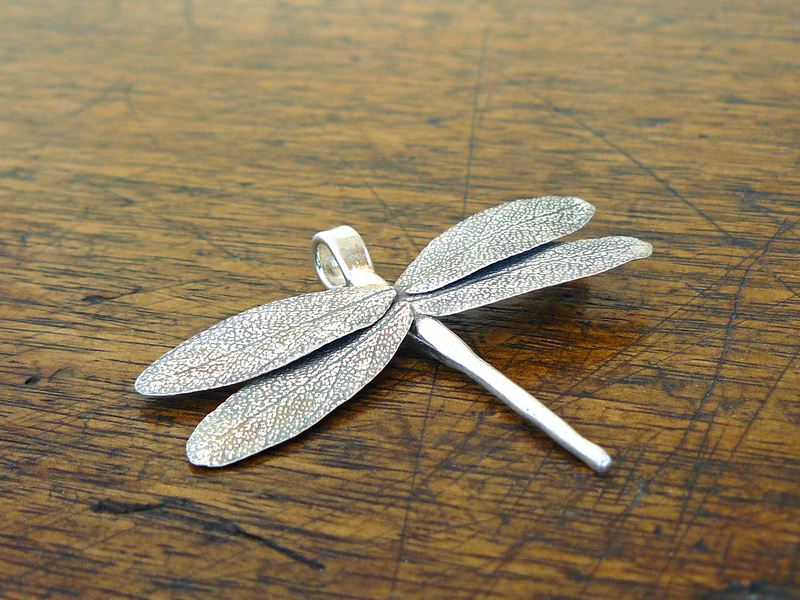 I have been working with fine silver metal clay for some time now and love it. I wondered how the sterling version would behave so I purchased some. I have made just one piece with sterling PMC. The photo above shows the new ring “Zen Gazing Disc Ring”. 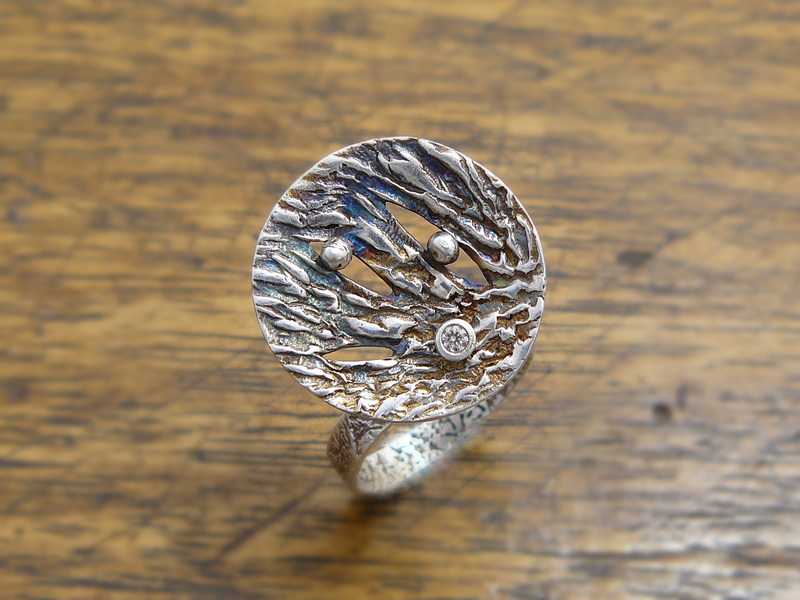 The design was somewhat inspired by a ring I made a long time ago entitled “Portable Zen Rock Garden”. The differences between the two rings are vast. This new ring has a larger focal element. Sterling is stronger when work hardened than fine silver so I was able to make this ring shank quite thin. 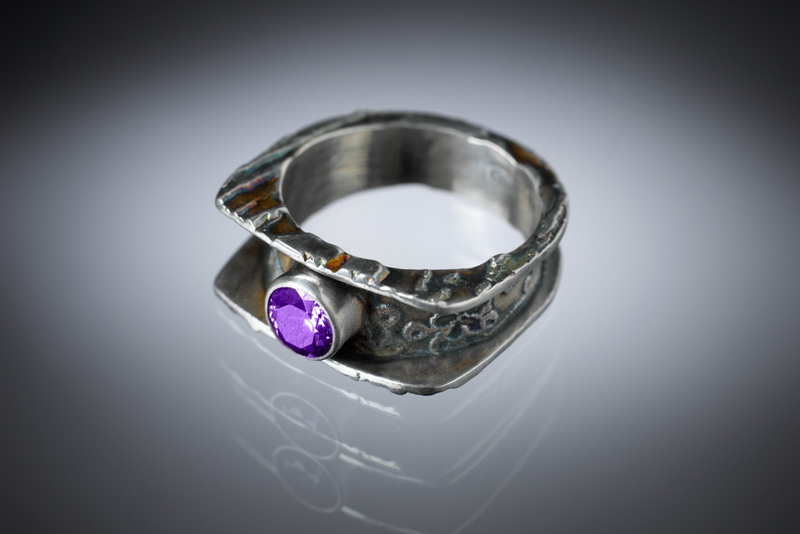 The original ring has a pleasing weighty feel however and there are certainly pros and cons to both fine silver and sterling. 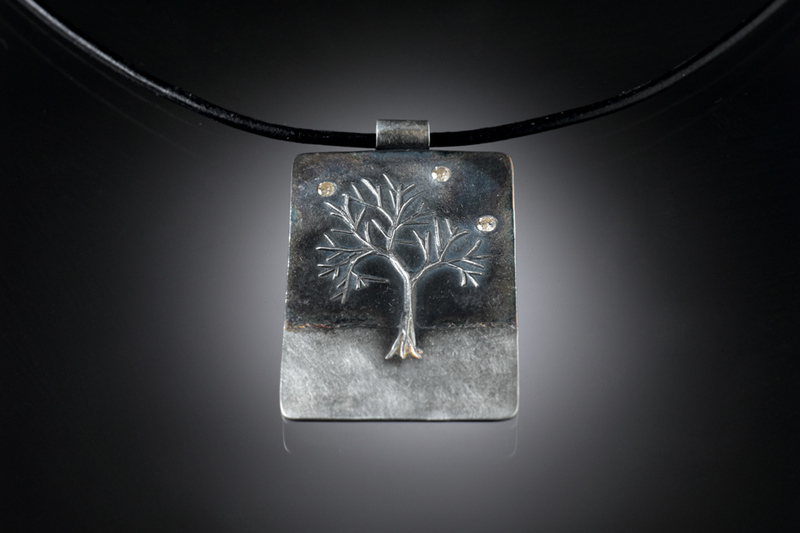 The sterling clay behaved for me the way I hoped it would, a lot like fine silver clay does. 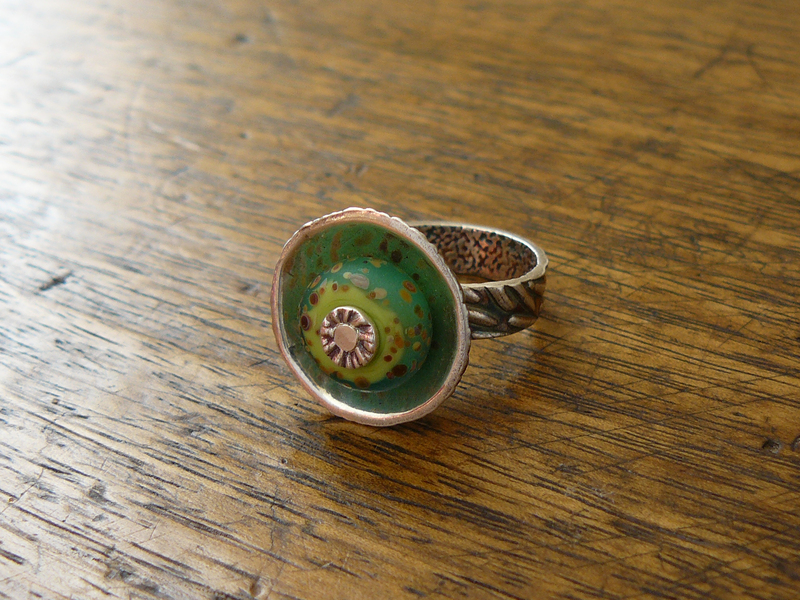 The only challenge I encountered making this ring regards shrinkage of the piece during firing. The stated shrinkage is higher than that of PMC3 and others have reported that rings lost about 3 sizes. I made this ring 3 sizes too large for my middle finger. After firing it does not fit on my middle or ring finger and it measures almost 4 sizes smaller than the dry piece had prior to firing. I will have to take this into account when I design future rings. On another subject, I have joined a group on Flickr this year entitled Four a Month and it is moderated by the fantastic and creative Lora Hart. I am posting my first four pieces starting today and continuing over the next few days. The idea behind the group is that the four pieces we make and post each month will all have a theme or unifying element about them. Lora has allowed for a great deal of freedom regarding what can qualify as a foursome. For my first set I chose butterflies. 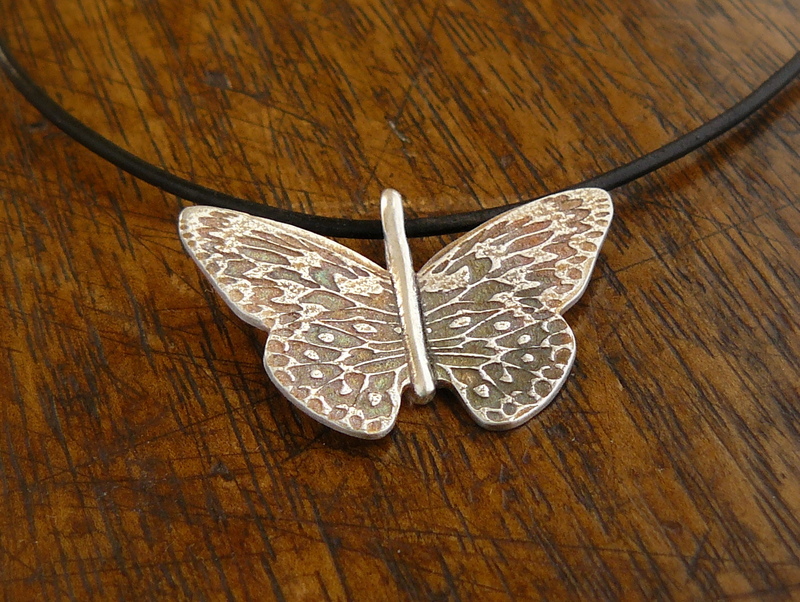 Below you will find a monarch inspired butterfly in fine silver with a necklace bail in the body of the butterfly. 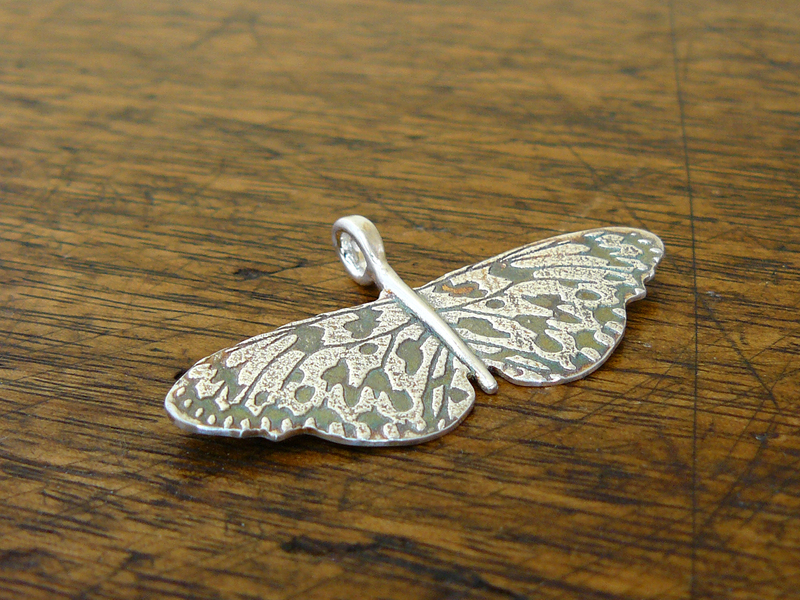 I have made a couple of other butterflies like it in the last year and they have been extremely warmly received. I do adore everything butterflies stand for, metamorphosis, grace, beauty, flight, rising above ones limitations to name a few. One woman told me she believes butterflies are the embodiment of the spirits of our lost loved ones. All four of the butterflies are made and finished at this point. I am working with some new photography equipment and software and two of the four will require me to spend more time with this new equipment so that I can produce nice photos. The next four pieces will be based on the four seasons theme and I have already made those as well. After those I will be presenting a series of four pieces based on box structures. 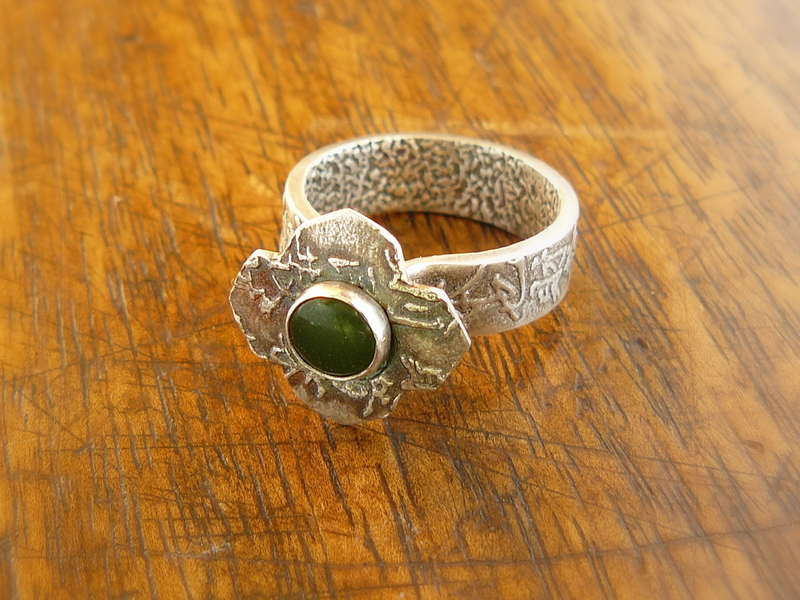 I have made three of the four and the remaining piece, a ring with a stone set in it, remains as greenware tidbits on my bench. I just completed two new rings. The one pictured above is entitled Double Blossom and is part hand sculpted and part cut out and domed. 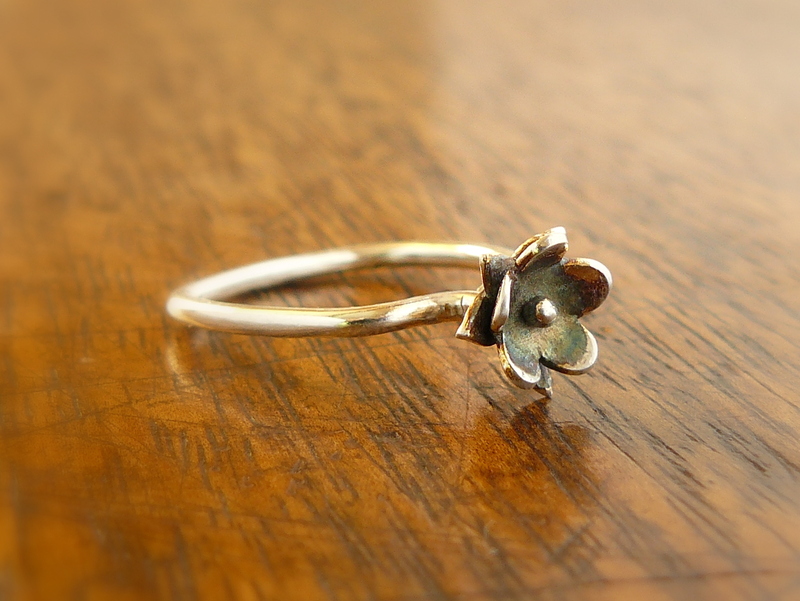 The ring is entirely fine silver with a wire shank and all of the floral component made from metal clay. The original design was to use the domed element to nestle a pearl. As I was assembling the ring it did not look the way I wanted sitting on top of the little pad the wire shank was embedded in, the flower was too small on top of the pad. Perhaps I mean that the pad had too much visual weight. I also felt that embedding wire for the pearl to mount on was going to make the cupped flower sit high in an unattractive way and perhaps add further visual weight to the pad underneath. So, on the fly I sculpted the little pointed petals and eliminated the pearl from the design, giving the flower a simple and much smaller ball center. I love this ring a lot and would not be considering selling it except the shank is about a whole size too large for my index finger. The ring below was begun in march. 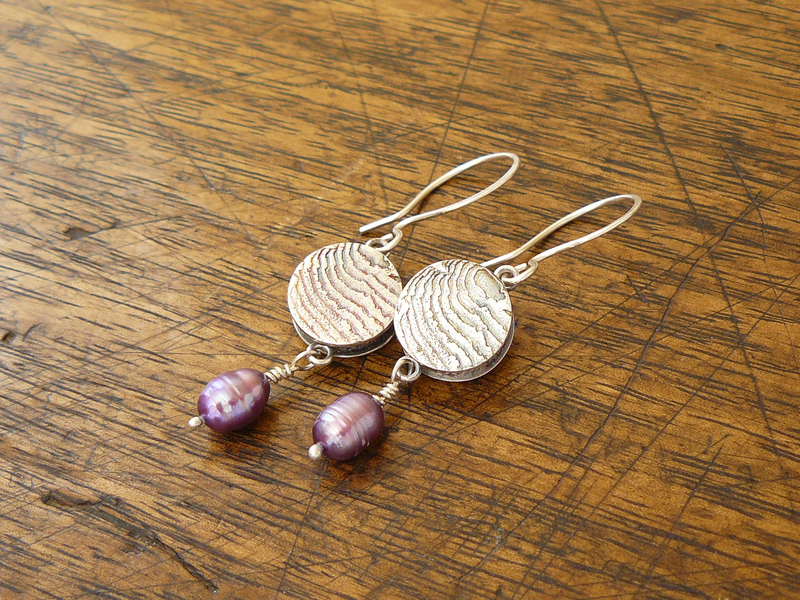 The shank was fired flat and shaped and then I got busy with other things and set it aside. I had at that time no firm design for the top of the ring and a long list of things I did know exactly how I wanted to make. So, in preparing for this Park Forest Art Fair I determined that making some rings would be warranted. I looked at my small pile of started projects and saw this shank. It had started to take on some patina from sitting in my studio unprotected and unloved while I made batch after batch of liver of sulfur solution. The shank looked lovely to be truthful! So as I prepared for this upcoming fair I let the idea of this shank and its unknown top element roll around in my head for a few days. I had just ordered some small nephrite jade stones and felt one would not be out of place in a chinese inspired work and that really got the the ideas flowing. I found a photo of some chinese dogwood blossoms and felt strongly attracted to them. As many of you know, I make a number of pieces with american dogwood blossoms as focal elements, in part because they were my Mother’s favorite flower. This blossom is very abstracted as it is all of one piece and has chinese calligraphy over its surface. The piece turned out well in my opinion. I got to use a little tip I saw Lora Hart mention recently when setting the stone. After I had used my bezel pusher I felt the very top edge of the bezel still had a tiny gap around the stone. She had mentioned using a chop stick to push very hard on the wire. This technique decreases the chance of harming a stone while finishing up the setting. It worked like a charm. Thank you Lora!